I was reading about this annual celebration of our work and discovered that it was established in 1992! Almost 25 years of celebrating midwives and the incredible care they provide pregnant and birthing people, and their families, all over the world. The International Confederation of Midwives spearheads this celebration. Separately and together, Christy and Jenni have celebrated International Day of Midwife in many different places and with lots of different activities. Here are previous years’ pictures and Christy’s post from 2009.
a) Hosting our monthly group prenatal at our office, with (as always) food demo’d by Christy and discussion facilitated by the three of us. Our topic this week is newborn care and early postpartum norms. b) Feeling grateful for midwifery knowledge and the home birth of Haven, now ten months old and making things very exciting at our house. c) Checking in with midwives from across Texas and our dear friend Marinah Farrell from Arizona, President of the Midwives Alliance of North America at the Association of Texas Midwives‘ Annual Conference (May 5 – 7). d) Appreciating the ever-growing skills and general fabulousness of our apprentice, Chandra Fisher. We are lucky to have her and I know that our current and past clients appreciate her involvement in their care at prenatals and births. e) Expanding Christy’s offering of primary care appointments and fertility consultations at our practice. See our website for more details and please refer your friends and family! f) Getting ready for the launch of midwifery-model culturally-appropriate prenatal education with the Mama Sana/Vibrant Woman clinic opening in June. Paula Rojas, a former apprentice with MotherBloom and now a Licensed Midwife, is integral to this project; Christy is a midwife advisor and Jenni is providing volunteer technical support with the use of an EHR. Thank you for continuing to support us both in doing this amazing work. Childbirth Connections has done it again! They have put together an evidence-based, very readable and user friendly tool explaining the importance of physiologic birth and the role hormones play when the body is allowed to gestate, labor, birth and breast feed without interventions. This report highlights the significant negative effect that stress (physical, emotional, financial, racial, etc) can have on people in all cultures who are pregnant and birthing their babies when they do not feel supported or nurtured. The Childbirth Connections website is full of useful information for both families and providers, please see the links below for some of the most pertinent documents. Today marks the long-anticipated publication of two articles on the outcomes of the Midwives Alliance of North America Statistics Registry (MANA Stats). This is the largest ever look at planned home births in the U.S., examining nearly 17,000 births. 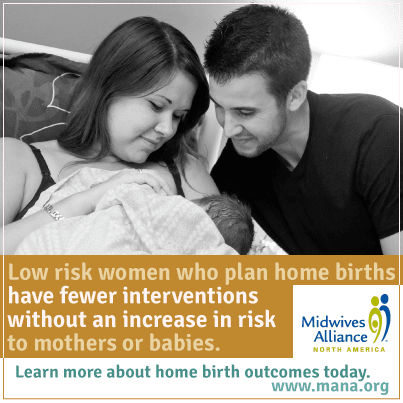 This study joins a growing body of research that shows that, for low-risk women, home birth with a skilled midwife is a safe option that has health benefits for mothers and babies. The study has implications far beyond home birth, because it shows the benefits of normal physiologic birth, which can be supported in any setting. Today’s study – unlike recent anti-home birth research that relies on birth certificate data – is based on the MANA Stats registry. The MANA Stats registry contains high-quality data that uses the gold standard – the medical record – instead of birth certificate data, which is notoriously unreliable for studying intended place of birth and newborn outcomes. While we can’t make a direct comparison to hospital outcomes (because they include women with different risk factors), we are happy to see such low intervention rates and high breastfeeding rates without increasing risk to mother and baby. Rates of fetal and newborn death were very low for babies without congenital anomalies: the risk of death to the fetus or newborn (including during labor, in the first week of life, or the first 28 days of life) was about 2 per 1,000. The risk of fetal and newborn death are even lower when women in higher-risk categories were excluded. When breech, previous cesarean, multiples, preeclampsia, and gestational diabetes were removed, the risk of death was about 1.6 per 1000. These rates are in line with other well-designed studies that look at home birth. In particular, babies born in the breech position appear to have the highest risk. At the conclusion of midwifery care, 98% of babies were being breastfed; 86% were exclusively breastfed. Nationally, only 77% of babies even begin breastfeeding, and we know how important this is to the lifelong health of babies and their mothers. We need your help to spread this good news! We’ve all read about the poorly designed research or data releases that suggest home birth isn’t safe. Opponents of a woman’s right to choose her place of birth have made sure those numbers have been widely spread. But together, we can ensure that women receive the accurate information they need to make well-informed decisions about their health care. First, you can learn more by reading our summary of findings here on the MANA blog. While you are there, please stop by the comments section and leave a note. Next, share the blog post widely on your Facebook page, on listservs, and with your community. While you are on Facebook, please consider stopping by the MANA page and sharing some of the visuals we designed to help educate consumers about the research. Please leave a comment too; every comment you leave means more people will learn about the positive outcomes of midwifery. You can also find a link to a fact sheet about the research to share with consumers over at the Citizens for Midwifery site. 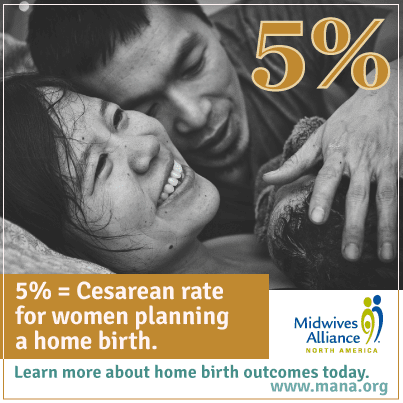 Please join us in thanking the many, many people who have made this possible, including the homebirth midwives who have diligently contributed to the MANA Stats database. We also thank the members of the MANA Division of Research who created the system, continually improved it over the years, and have put quality assurance processes in place to make sure the data are sound. We are very grateful to the Foundation for the Advancement of Midwifery for providing ongoing financial support for the MANA Statistic Project. And finally, we thank the researchers who validated and analyzed the data and shepherded these articles down the long road to publication. Copyright © 2014 Midwives Alliance of North America, All rights reserved. You received this email because of your relationship with MANA. Interesting points: St. David’s Hospital in Austin has a much higher c/section rate than I anticipated- wowza! ; the c/section rate in the Texas valley is extremely high-way over the national average ….I can’t help but think racial/economic discrimination is at play; and you’ll notice that the birth center study I posted about a few days ago had a VBAC success rate that far surpasses the rate of any of the hospitals listed here. A new study was released today from the American Association of Birth Centers (AABC), Outcomes of Care in Birth Centers: Demonstration of a Durable Model. The outcomes for mothers and babies are excellent and comparable to other out-of-hospital birth settings in other countries. The only disappointment is that because of exclusion protocols at most birth centers in the US, there were only 56 cases of vaginal birth after cesarean (VBAC) attempts in the study of 15, 574 births. 70% of the women did successfully VBAC, but unfortunately this is not a large enough VBAC cohort to give us new information to further validate the safety of VBAC in home or birth center settings.